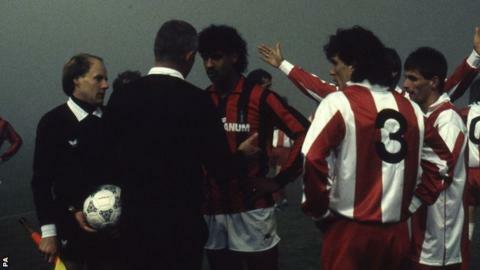 Paolo Maldini, Franco Baresi, Frank Rijkaard, Ruud Gullit, Roberto Donadoni, Carlo Ancelotti and Marco van Basten. The AC Milan side built with the money of former Italian Prime Minister Silvio Berlusconi in the late 1980s would go on to become known as 'The Immortals' after collecting 10 major honours in nine years, including three European Cups. They remain the last team to successfully defend that trophy. The AC Milan team of 1989 which included Maldini, Baresi, Rijkaard, Gullit, Donadoni and Van Basten. But their run of dominance in Europe was almost curtailed before it had begun. Twenty five years ago, Arrigo Sacchi's star-filled side found themselves facing defeat by Red Star Belgrade in the second round of the 1988-89 European Cup. With half an hour of the second leg remaining, Sacchi's men were 2-1 down on aggregate and reduced to 10 men after striker Pietro Paolo Virdis was sent off. The Serie A champions needed a saviour, and found one in unlikely circumstances as a thick fog enveloped the Red Star Stadium, forcing referee Dieter Pauly to call the game off. "It was almost the end of the dream for Milan," then Red Star captain Dragan Stojkovic told BBC Sport. "After the game, Milan recognised they were very, very lucky. Maybe it was an act of God! Even today when I talk to Milan director Adriano Galliani he laughs about it and says 'Thanks to the fog in Belgrade we became a big team!'" Under Sacchi, Milan pipped a Napoli side containing Maradona and Careca to the Serie A title in spring 1988 - their first championship in nine years. Chasing a first European Cup triumph since 1969, the Rossoneri waltzed through the first round, thrashing PFC Levski Sofia 7-2 on aggregate, with Van Basten scoring four in the second leg. Second-round opponents Red Star would prove much tougher to crack though, as the champions of the former Yugoslavia took a 1-1 draw home from the first leg at the San Siro, with Stojkovic opening the scoring after a jinking run in from the right flank. "That was one of the most beautiful moments in my career," the 48-year-old remembers. "It was a really big challenge for us to play in a full San Siro but we put in a fantastic performance. "For my goal, I dribbled past the entire defence, especially Franco Baresi, to score a goal and it was an amazing moment. Red Star then showed strong mentality and strong character not to raise the white flag. We surprised a lot of people that night but we knew it was not over." The second leg, on 9 November 1988, started badly for Milan as Dejan Savicevic, whose summer move to Red Star had been disrupted by a call-up for 12 months' mandatory military service, smashed in an opener after another surging run from skipper Stojkovic. Virdis then saw red after a clash with Goran Juric to leave Sacchi's side with 10 men just after half-time. "Milan were on their knees," says Stojkovic. "But then everything happened very quickly. After 10 minutes of the second half the fog came in and, in one moment, suddenly it was invisible. The referee wanted to let us play but he had no choice, it was impossible. "At half-time the visibility was fine, but minute by minute it got worse, First, I couldn't see the stand. Then I couldn't see the goal. Then I couldn't see the penalty area. Then I couldn't see the ball!" Referee Pauly had no option but to postpone the game in the 57th minute and hand Milan a lifeline. It was one they would take 24 hours later. Sitting in the dressing room after the fog closed in, Stojkovic and his team were shocked to see coach Vladimir Petrovic agree to Milan's wish to replay the game the next afternoon. "We knew it was a bad idea, we needed a rest," he says. "Savicevic was in the military, he was not a full professional footballer and the advantage was now with Milan. They were monsters physically, with many good players on the bench who could help them. They had Gullit back for the second game! I felt like I was playing alone." A few months earlier Gullit had scored alongside Van Basten in the Euro 1988 final, but had been struggling with injury. An extra day's rest allowed Sacchi to name another of his prize assets on the bench for the replay. With the fog fully cleared and the stadium again packed, Van Basten got the better of a static defence to head Milan ahead before Stojkovic replied, latching on to a pass from the tiring Savicevic to lash into the roof of the net. Gullit came on early in the second half but could not inspire Milan, with the game going on to penalties. Stojkovic scored from the spot but Savicevic missed as Milan won 4-2 in the shootout. After their scare in Belgrade, Milan went through the gears, destroying Real Madrid 6-1 in the semi-final before Gullit and Van Basten scored twice each to thrash Steaua Bucharest 4-0 in the final at the Nou Camp. They defended their title in Vienna 12 months later, Rijkaard's goal enough for a 1-0 win against Benfica, before a third win in six seasons was sealed in 1994's 4-0 demolition of Johan Cruyff's 'Dream Team' at Barcelona - with Savicevic on target. "That Milan team was not one of the best, it was the best from my point of view. The best ever," says Stojkovic. "When we lost on penalties, after the game as captain I said to my team-mates be happy, don't cry. "Rijkaard came to me and told me to be proud, he said 'you are a really big player.' That was a big compliment for me to receive from a big star. He told me Milan were very lucky. "Everything was even in the three games. We played very good football so who knows what the limit of that Red Star team was. Maybe we could have reached the final if we beat Milan? Blame the fog for that." Red Star would have their night in the spotlight in 1991, when a side containing fresh talent such as Darko Pancev, Sinisa Mihajlovic and Robert Prosinecki lifted the European Cup, beating Stojkovic's Marseille on penalty kicks. And Stojkovic, who claims that Milan tried to sign him as he penned a move to Marseille, would finally earn his European Cup winner's medal in 1993, beating Milan in the process. "I have no regrets, it is just great to be part of footballing history," he says. "But Milan will never forget those two games in Belgrade. They were born in the Belgrade fog." Jonathan Stevenson blog: Who's the greatest? Read more on Jonathan Stevenson blog: Who's the greatest?